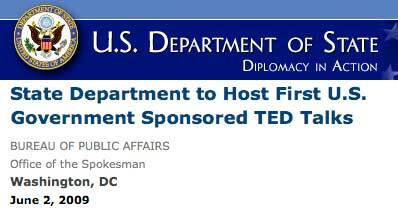 Long Now Foundation Seminar host and board member Stewart Brand, as well as former Seminar speaker Clay Shirky will be presenting on June 3rd at the US State department in their first mini TED conference. It looks like those of you in the press might be able to get a pass, otherwise it will be posted on the TED site at some point in the future. update: The talks were also mentioned on the White House Blog along with a mention of Long Now.